The basic structure of sewing machine is the same whether it is hand-operated sewing, treadle sewing machine or electric sewing machine. 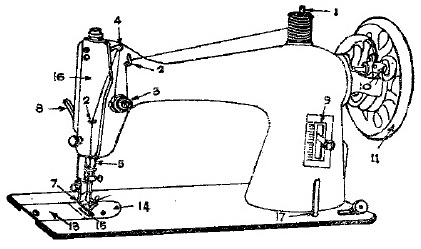 The basic parts of a sewing are listed below and seen in Fig. 1. Spool pin: It is fitted on top of the arm to hold the reel. 2. Thread guide: It holds the thread in position from the spool to the needle. 4. Take up lever: It is a lever fitted to the body of the arm. Its up and down motion feeds the thread to the needle and tightens the loop formed by the shuttle. 5. Needle bar: This is a steel rod to hold the needle at one end with the help of a clamp. Its main function is to give motion to the needle. 6. Bobbin case: This moves into position to catch the top thread and form the stitch as the needle is lowered into the bobbin chamber. 7. Presser foot: It is fixed to the presser bar to hold the cloth firmly in position when lowered. 8. Presser foot lifter: A lever attached to the presser bar for raising and lowering the presser foot. 9. Stitch regulator: This controls the length of the stitch. 10. Bobbin winder: A simple mechanism used for winding thread on the bobbin. 12. Clutch or Thumb Screw: This is in the center of the fly wheel and it engages and disengages the stitching mechanism. 13. Slide Plate: A rectangular plate, which facilitates the removal of the bobbin case without lifting the machine. 14. Needle Plate or Throat Plate: A semi-circular disc with a hole to allow the needle to pass through it. 15. Feed dog: This consists of a set of teeth fitted below the needle plate. It helps to move the cloth forward while sewing. 16. Face plate: A cover which on removal gives access to the oiling points on the needle bar, presser bar and take-up lever. 17. Spool pin for bobbin winding: Spool of thread is placed on this at the time of bobbin winding.